While we all get headaches from time to time, sometimes they become persistent and require attention. Migraines can be totally debilitating, forcing you to lie in a darkened room for days on end wishing the world would end and put you out of your misery. While the evidence supporting the use of Chiropractic as a treatment for migraines is inconclusive, it can sometimes help in the prevention of an attack. If you suffer more from simple headaches, on the other hand, they may be coming from your neck – and then Chiropractic may well be the answer! If you have never suffered from Migraines, then you can’t fully understand the misery it entails. Every person experiences them differently, but there is usually some combination of a severe headache, photophobia (intolerance of light), nausea and a phenomenon called “aura”, in which visual disturbances such as flashing lights and jagged lines interrupt sight. You don’t have to have all of these symptoms to be experiencing a migraine, but usually more than one is present. What exactly causes migraine headaches is still unclear – there are several theories such as an inflammation of the blood vessels in the brain, but no one knows for sure. What is clear is that most sufferers have a certain trigger that will set them off. For women, there is often a hormonal component to it, but it is also well recognised that certain foods can become triggers, such as chocolate, coffee and bananas. In other situations, it is simply a response to severe emotional stress and tension. While there is little to be done to help a hormonal trigger, it may be useful for the migraine-sufferer to keep a food diary for a period so that they can look back accurately at the things they ate in the days and hours leading up to their migraine and identify any common foodstuffs which may be setting off their headache. For the sake of clarity, let’s say our mythical patient finds that every time they have a migraine, they had something with tomatoes in shortly before. Now, there is still a chance that this is pure coincidence, so the next stage would be to completely cut out tomatoes from their diet – not only the fruit itself, but also anything containing tomatoes, including in cooked or pureed forms. Once they have managed this for a period, we would then review whether they have had any migraines since taking this action. If they hadn’t, then the chances are that eliminating tomatoes from their diet is the answer. If they have, however, then we would need to decide whether there had been any change in the migraine in an effort to decide whether it just needs more time to get the tomato-based influence out of their body’s system, whether there are more than one food-triggers or whether it was just coincidence that tomatoes were eaten shortly before a migraine attack and actually something else is the trigger. Clearly, if there is only one food trigger, the process is relatively simple, but sometimes there is more than one foodstuff involved and then you have the task of trying to establish which two things are being consumed together to cause the migraine. This process can be prolonged, and it is best to seek the help of a healthcare professional such as a Chiropractor to help guide you through the process. If you decide with your Chiropractor that there are no hormonal or food triggers, but that you generally get a migraine when everyone at work is on your case, the kids are kicking off and your partner is being no help whatsoever, then perhaps stress is the causing factor. This is where Chiropractic can be extremely helpful. Emotional stress causes a physical response in your body – the muscles become tight and your posture changes, often with your shoulders lifting towards your ears and a general stiffening throughout your spine. Whilst I don’t claim to be able to make your kids behave, your partner perfect or your colleagues capable, Chiropractic can certainly help with the effect of your emotional stress by relaxing tight muscles using massage and other forms of soft tissue work, and restoring movements to the joints through the use of adjustments. This may be enough to reduce the frequency and intensity of your migraines – I have even had a few cases where they ceased altogether. But what if your headache is just that – a headache. Not a migraine, just your normal pain that goes up the back of your head, curls round and comes to a pulsing stop somewhere around your eye. Can Chiropractic help then? Definitely! This pattern of pain is commonly seen where there are issues in the muscles and joints of the neck which then radiate pain in this way. Of course, there are many other causes of headaches, including nerve problems, tumours and all sorts of other “nasties”, but your Chiropractor will have worked hard during your first appointment to ensure that none of these are the reason behind your pain. 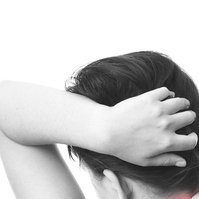 Once they have done that, and they are convinced that your headache is what is known as “cervicogenic” (cervico- meaning the neck, -genic meaning coming from), then they will begin to treat your complaint by freeing off those restricted joints and tight muscles, so that your headache is relieved. As with any joint or muscle complaint, it may take several treatment sessions before movement is fully restored and your headache ceases, but at least something is being done and it will make your life easier in the end!